If you're interested in the natural eating habits of rabbits, then all you have to do is consider what the floppy-eared lagomorphs eat in the wild, of their own volition. Wild rabbits are a common sight in many types of environments, including grasslands, woodlands, gardens and even bustling urban parks. They live on all of the planet's continents, too, bar Antarctica. Wild rabbits are classic herbivores. Their menus differ slightly depending on the season. In the coldest times of the year, they chow down on lots of green vegetation, woody shoots, tree bark, conifer needles and buds. In the spring and summer, wild rabbits focus their attentions onto agricultural crops, flowers, grass and clovers. It isn't uncommon for the fluffy creatures to eat tasty cultivated fruits and vegetables, which is why they're sometimes thought of as frustrating pests. Although wild rabbits indeed love their plants, they are rather choosy with how they go about eating them. They're usually much more enthusiastic about consuming foliage than stems, for example. They also prefer to eat new plants whenever possible. Dry plants are not a priority for them. 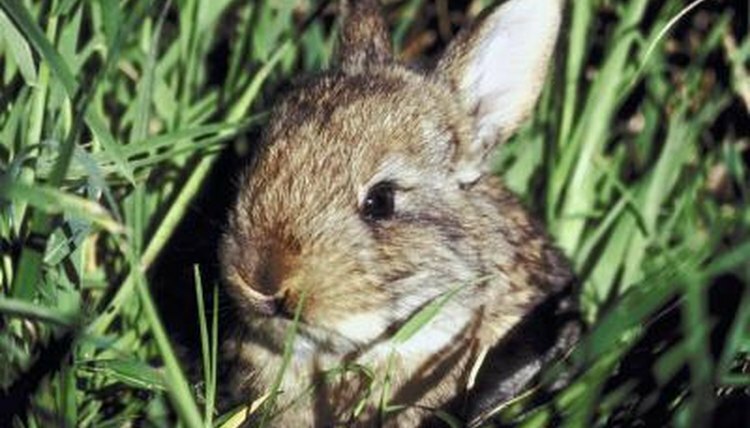 Wild rabbits generally eat more protein and less fiber when all accessible plant sustenance is taken into consideration. Wild rabbits tend to follow pretty reliable meal schedules. For the most part, they eat first thing in the morning at daybreak and then again right in the beginning of the evening. Their basic feeding schedule carries over to many rabbits in captivity, who do a lot of their eating during those specific times of the day, too. Diets for pet domestic rabbits are based on those that the wild cuties eat. Rabbits in captivity eat a lot of grass hay -- think brome hay. They flourish when they have this stuff available to them at all times, as it's beneficial for their digestive systems. Apart from hay, domestic rabbits also do well when offered commercial pellets. Growing juvenile bunnies should be allowed to eat unrestricted amounts of pellets. Once they're mature at roughly 6 months in age, however, their pellet portions need to be monitored. Lastly, vegetables are also welcome elements in pet rabbit diets. Collard greens are an example of a nutritious and rabbit-friendly veggie. Other suitable vegetables are kale, watercress, Swiss chard, mustard greens, dandelion greens and broccoli. Never give your rabbit any food unless you have prior veterinary approval. Remember, too, that fresh and clean water is a constant rabbit dietary essential. Rabbit Production: James I. McNitt, Steven D. Lukefahr, Peter R. Cheeke et al.